​​ ​​​MANOR – The only place to grow is east—apartments will raise the bar for amenities (and prices) in Austin's suburb of Manor. 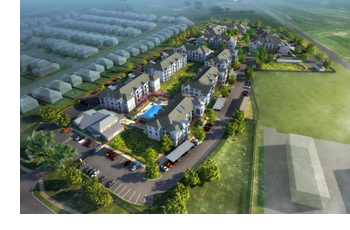 RightQuest LLC broke ground on the Flats at ShadowGlen, a 248-unit multifamily project in the ShadowGlen master-planned community. Flats at ShadowGlen is expected to open in summer 2019. Monthly rents will range from $991 to $1,700 per unit​​. The 12-acre project at ShadowGlen Trace and FM 973 is expected to open in summer 2019. Amenities will include a clubhouse with media center, business and fitness centers, a resort-style swimming pool, a large dog park, and a pavilion with string lighting and detached garages. ​Check out Austin-Round Rock Multifamily Market Research.